In the grandeur of the North Cascades, moonless nights with clear skies offer fantastic opportunities to capture vivid images of the galaxy. Join photographer Andy Porter on this evening expedition to capture images of the Milky Way on this moonless night. 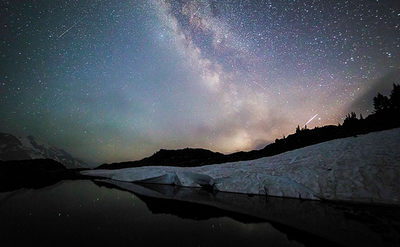 We’ll convene in Glacier for a short evening workshop on night photography. We’ll then continue our adventure up the Mount Baker Highway to Artist Point where Andy will guide us in capturing our nighttime images. With Mount Baker and Mount Shuksan contrasting against the night sky, you are sure to manifest a variety of creative evening images unique to the North Cascades landscape. Andy is an award-winning photographer based in Skagit Valley. His North Cascades photographs have been featured in the Smithsonian Museum and the book The North Cascades: Finding Beauty and Renewal in the Wild Nearby, published in 2014 by The Mountaineers. You will need to bring your own equipment, including a DSLR camera, wide-angle lens (preferably 14 to 24 mm), sturdy tripod and a cable release.